When 13-year-old Jake's (Theo Taplitz) grandfather dies, his family moves from Manhattan back into his father's Brooklyn home. There, Jake befriends the charismatic Tony (Michael Barbieri), whose single, Chilean mother Leonor (Paulina Garcia) runs the dress shop downstairs. When Jake's parents Brian (Greg Kinnear) and Kathy (Jennifer Ehle) ask Leonor to pay a higher rent and a feud ignites between the adults the boys take an oath of silence against their parents in protest. 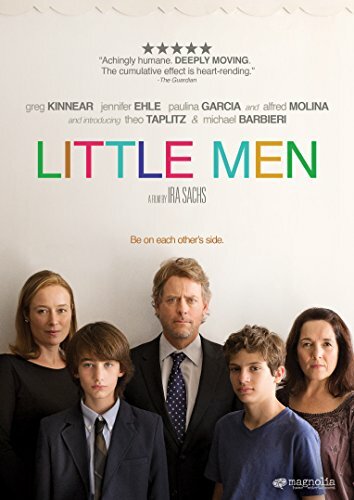 Directed by Ira Sachs (Love is Strange, Keep the Lights On, Forty Shades of Blue) with his trademark humanism and insight, Little Men is the story of a life defining friendship amid family turmoil, and one of the best reviewed American films in years.